As a team, we are passionate about all the children that God brings our way whether on Sunday mornings or during the week. Our desire is to create a fun and vibrant environment where children can form strong relationships with their peers, the team and God, and feel loved, accepted and believed in. 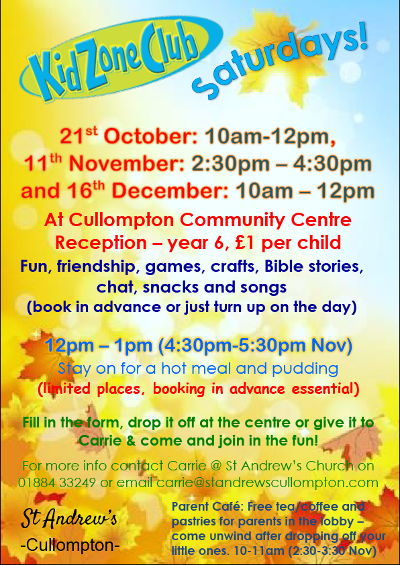 If you would like to know more about any aspect of the children’s work, please feel free to get in touch with Carrie Tucker (Children & Families’ Pastor) on 01884 33249 or click here to email her, she would love to chat with you. The 11am service on the first Sunday of the month is our 45 minute all age gathering. We have a great time making crafts, singing, looking at the Bible, praying and celebrating God in lots of interactive ways. On the other Sundays of the month we run Sunday groups for children aged 0–11. After a brief time in the service children head out to the Community Centre next door to join one of our four groups for an exciting time of craft, games, chat, prayer & getting into the Bible. Games, crafts, music, Bible stories, fun, friendship & special events! Come and check us out during term times on Wednesdays, 6.15–7.30pm, at St Andrew’s Primary School. £1 per child. School years 1–6 – contact Carrie or click here to email her for more details. Click here to download the KidZone 10th Anniversary PowerPoint used in 5th March Service. 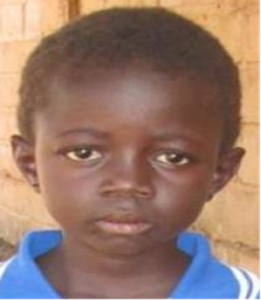 At KidZone we sponsor a girl called Angele through the company Compassion UK. We exchange letters with Angele on a regular basis and you can read her latest letter.